Starting with version 7.0, cartoons can be animated. To make an animated cartoon, convert your photo into a regular cartoon and then select Animation->Animate from the program menu. You will see an animation similar to that below. 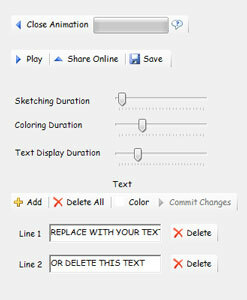 To change the duration of the sketching phase or the duration of the coloring phase of the animation, use the Sketching Duration or Coloring Duration sliders. Every time a modification is made using these sliders, the animation restarts with the new settings. When there are many outlines in the picture, the actual sketching phase may take longer. If the cartoon includes speech bubbles, the Text Display Duration slider controls the duration of time the bubbles are displayed before the animation ends. This setting only applies when the animation restarts after it ends, for example, in GIF format. If the cartoon doesn't include speech bubbles, you can add text or replace the sample text with your own. In this case, the Text Display Duration slider controls the duration of each line of text. To delete the text, click the Delete All button. To delete one line of text, click the Delete button. To add a line of text, click Add and type in new text. To modify a line of text, click on it and change it. The color of the text can be changed as well. The changes to the text take effect only after the Commit Changes button (or the Play button) is pressed. The only exception is the Delete All button - the animation is updated and restarted right away when this button is clicked. To save an animated cartoon, click Save, enter a file name and select one of the available formats, SVG, AVI or GIF. The created AVI and GIF files may be large. AVI is most useful when sharing on YouTube and GIF and SVG files can be included in a web page. SVG files are saved right away and recording an AVI or GIF takes an amount of time equal to the duration of the animation. While recording is in progress, the "Recording now, please wait..." message will be displayed. If the AVI format is selected, a pop up window will offer the option for selecting the type of video compression. The choice depends on which codecs are installed on your computer. Choosing Full Frames will result in a large file. 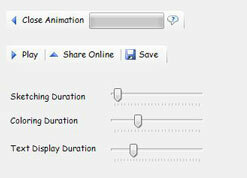 The easiest way to share an animated cartoon online is to use the Share Online button instead of the Save button. It will take a few moments for your animation to upload to our server and then you will see a window with links that you can use on Facebook or elsewhere. Only the Solid, No Outlines and Outlines styles can be used to create an animation. The animation tool will use the Solid coloring style if any other style is set. The coloring part of the animation will be skipped if colors are turned off.